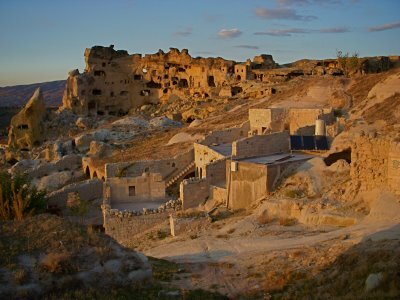 The town of Cavusin is one of the oldest inhabited areas of Cappadocia, a slow relaxed town, a delight to spend a night. 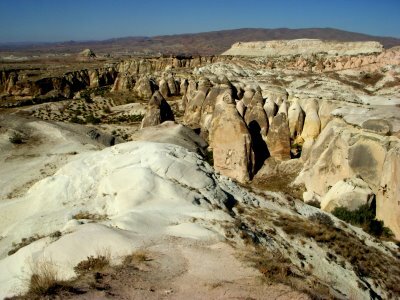 However most people stay in Goreme and take a day trip to Cavusin and the surrounding valleys. 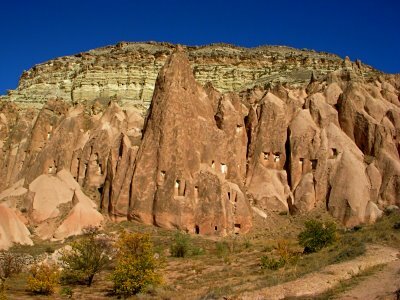 Goreme is only 2 kilometers down the road. Many tour buses come and go here in Cavusin. The top picture is the high rock hill that dominates the town of Cavusin. Walking (uphill) to the area behind and on top of that rock hill the landscape is ultimately beautiful as the pictures display. Millions of years ago, three mountains—Ercleys, Hassandag, and Gulludag were active volcanoes. The volcanic activity continued into the Neolithic period, many caves portray prehistoric paintings on the walls. 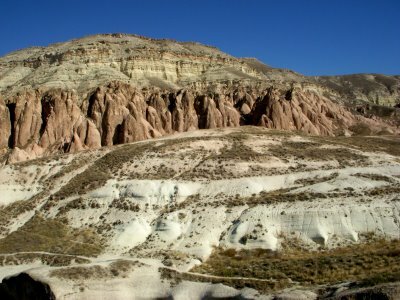 A plateau of tuff formed from the discharge of the volcanoes—these layers of tuff were exposed to rain and water from rivers that cause erosion. Floodwater pouring down into the valleys combined with heavy gusting winds ripped away the softer layers of volcanic rock exposing the harder inner layers of rock. 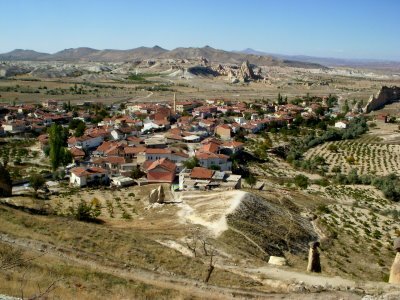 The two pecks you see in the above picture is the town of Uchisar, Goreme is to the left of Uchisar. As I trek through the different valleys this natural phenomenon will be clearly observable. Followed by the Hittites, the Hattis and Phrygians inhabited the land. 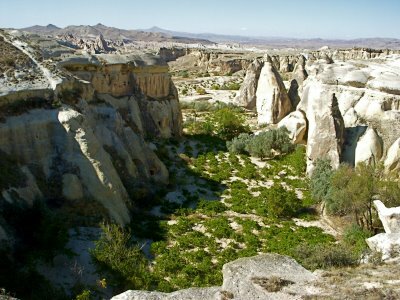 Cappadocia must have been an incredible place to live during that time era. 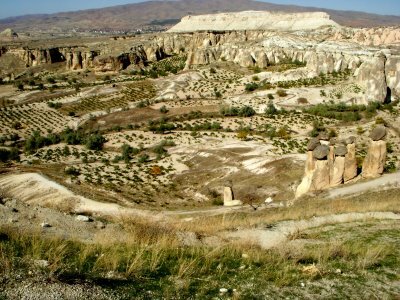 After the Phrygians, the Persians, Romans, Byzantines, Seljuks, and the Ottomans left their impression and influence among the towns of Cappadocia. 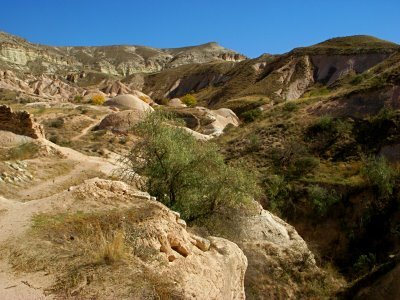 Cappadocia is an amazing place to visit, a top site for a landscape lover, although The White desert in Egypt is still the top area of landscapes I have visited so far. Looking at the calender, I routed my timetable. This may sound strange, although I have a tendency to lose track of time and the day of the week. I will be heading down to the south coast by Sunday or Monday and travel up the coast and I might be visiting Pamukkale which is inland. I will be arriving in Istanbul around November First. I will spend five to seven days in Istanbul which will give me about ten days to get to Athens for my fight to Israel. Next post: The Red & Rose Valley—Cappadoica. 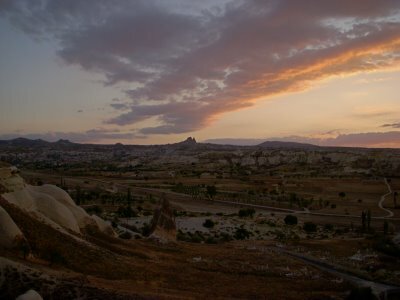 Previous post: Urgup, The BackSide—Cappdocia.